Acting for Racial and Economic Justice (AFREJ) works for racial and economic justice in the BWC community, the Jewish community, and Boston community at large. AFREJ is currently working on a campaign for racial justice in the Town of Brookline called Government Alliance for Race & Equity (GARE), and we need your support! This year the Town of Brookline became a member of the Government Alliance on Race and Equity (GARE). We are the first municipality in New England to join the City of Boston in signing on to GARE. 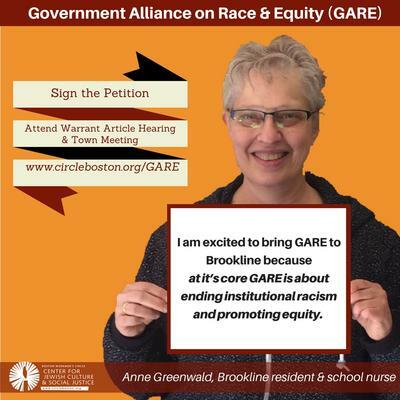 A group of Brookline citizens have submitted a Warrant Article to formalize the Town of Brookline’s commitment to use the GARE tools and sustain the work on advancing racial equity in our community. Our goal is to make Brookline a community that welcomes and values all. The disparities caused by racism exist in every area of this country. Brookline, while no better and no worse, is no exception to this. These disparities can be seen in health, housing, education, employment, policing, to name a few. GARE provides tools to explicitly incorporate a lens of racial equity into town processes that not only identifies the problems but also provides methods for creating solutions that will work.in our community. The Government Alliance on Race and Equity (GARE) is a national network of government municipalities working to achieve racial equity and advance opportunities for all. Across the country, governmental jurisdictions are using the tools of GARE to make a commitment to racial equity. They do this through focusing on changing existing local institutions so that their policies and practices do not contain structural racism. Racial equity tools are designed to integrate explicit consideration of racial equity in decisions, including policies, practices, programs, and budgets. It is both a product and a process. A racial equity tool proactively seeks to eliminate racial inequities and advance equity. It identifies clear goals, objectives and measurable outcomes and engages community in decision-making processes, The tool identifies who will benefit or be burdened by a given decision, examines potential unintended consequences of a decision, and develops strategies to advance racial equity and mitigate unintended negative consequences and then develops mechanisms for successful implementation and evaluation of impact. Join the GARE Working Group at Boston Workmen’s Circle! The GARE Working Group meets on the 4th Wednesday of the month from 7-9pm at Boston Workmen's Circle. Contact Chris and Tolle with questions.